Editor's note: This is an updated version of a column originally published on 27 November 2017. In our original Vox column from 28 November 2017 (see below), we estimated the output costs of the Brexit vote that had already materialised since the June 2016 referendum. Our new estimate uses the latest OECD data to update and extend the estimates to mid-2018. We now estimate that the output loss due to the Brexit vote amounts to about 2% of GDP, or £35 billion. The negative drag from the Brexit vote has increased somewhat since our last estimation and now amounts to roughly £350 million a week. Under current OECD forecast, we expect the output loss to increase to 3.4% of GDP by end-2019. 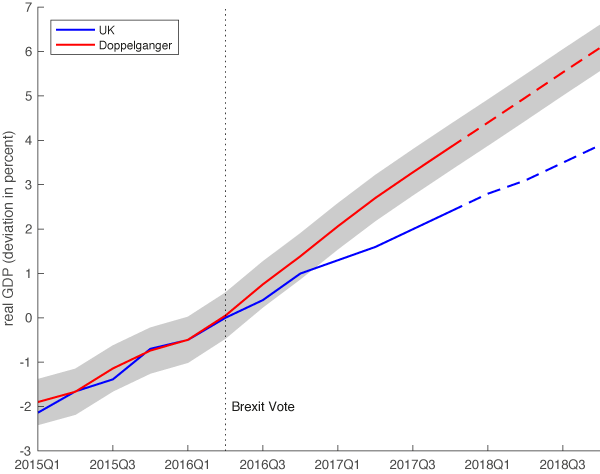 The figure below compares actual output in the UK (blue) to the counterfactual UK economy that could have been expected otherwise (the “doppelganger”). The originally estimated doppelganger (black) is constructed using data from November 2017, while the latest doppelganger is based on the most recent data (red). As before, dashed lines indicate forecasts and the shaded area corresponds to one standard deviation of the pre-Brexit vote difference between the UK and its doppelganger. That's why we take a different approach in a recent paper (Born et al. 2017). Rather than making set of assumptions which are bound to be controversial, and using them to forecast the economic costs of Brexit, we measure the actual output loss from the UK's decision to leave the EU. Our approach does not depend on having the right model for the British, the European, or even the global economy. We do not assume a particular Brexit deal, or construct specific scenarios for the outcome of the negotiations. Instead we create a transparent, unbiased, and entirely-data driven ‘Brexit cost tracker’ that relies on synthetic control methods (Abadie and Gardeazabal 2003). What if the referendum had never happened? Finding an appropriate counterfactual is a daunting task when the treated unit is a whole country (in this case, the UK). In the public debate, one common practice is to informally pick another country with a similar economic structure and compare outcomes. For instance, one could compare the performance of the UK economy since the referendum to European countries such as Germany, or to the US or Canada. Yet clearly this is unsatisfactory. How can we know which countries to compare? Was their growth path pre-intervention really similar to that of the UK? Our approach to determining the costs of the Brexit vote uses the same intuitive idea, but it formalises the approach in a statistical sense. We let an algorithm determine which combination of other economies matched the evolution of real GDP in the UK before the Brexit vote with highest possible accuracy. We use the period between Q1 of 1995 and the Brexit vote in Q2 of 2016. For this purpose, we consider indices of real GDP for 30 OECD countries, normalised to unity in 1995. The algorithm choses the economies and weights assigned, not researchers. The better the algorithm-driven economic doppelganger for the UK economy as a weighted combination of other OECD economies, the more accurate our results are. For the UK, our matching algorithm attributes high weights to Canada and the US, but also to Japan and Hungary. These weights are open to replication by other researchers. 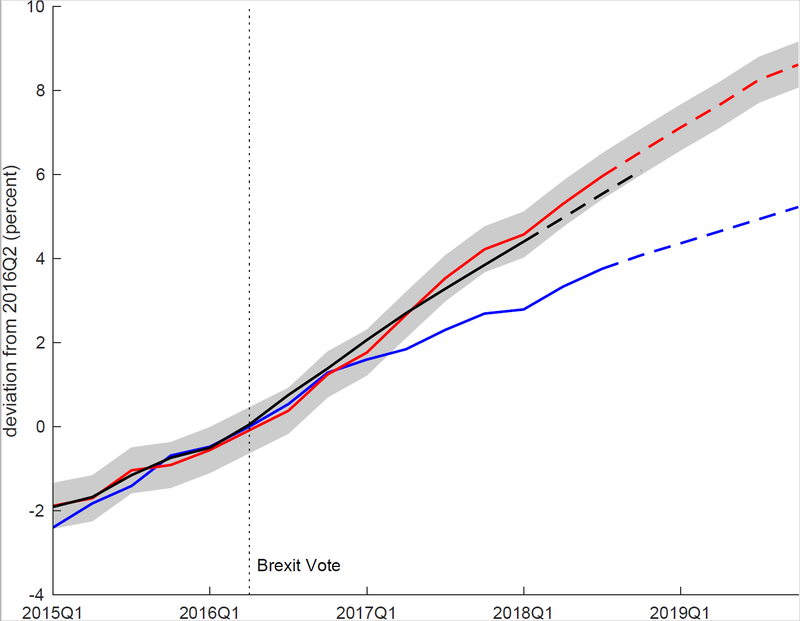 Figure 1 shows that our synthetic UK economy (red line) tracks the evolution of the UK (blue line) very closely before the referendum. The doppelganger had the same trend growth of the UK and exhibited very similar short-run fluctuations. For instance, it matches the fall in output during the Great Recession, and the subsequent recovery. Note: Dashed lines are forecasts. Shaded area corresponds to one standard deviation of the pre-treatment difference between UK and doppelganger. We then use the doppelganger of the pre-Brexit UK economy to quantify the cost of the Brexit vote. As the doppelganger is not treated with the Brexit vote, it will continue to evolve in a similar way to how the pre-Brexit economy would have evolved if the referendum had never happened. It shows, in other words, the counterfactual performance of the UK economy, and the divergent output paths between the UK economy and its doppelganger capture the effect of the referendum. This ‘synthetic control method’ has been successfully applied to study similar one-off events, such as German reunification and the introduction of tobacco laws in the US (Abadie et al. 2010, 2015). Using current forecasts, the cumulative costs would be expected to grow to more than £60 billion by year-end 2018, and the output gap of the UK compared to its doppelganger would be expected to increase to 2.2% of GDP. In other words, even before Brexit actually happens, the output loss triggered by the decision could be equivalent to about seven years of the UK’s net contribution to the EU budget. When we study the evolution of consumption and investment in the UK economy relative to the performance of the doppelganger economy, both investment and consumption contribute equally to the decline in output. By Q2 2017, their contribution is a little more than half a percentage point each. This is, of course, a stronger drop in investment, given its smaller share in GDP, but it is nevertheless a sizeable decline in consumption. We are able to use the synthetic control method to quantify the potential importance of increased uncertainty for output decline. 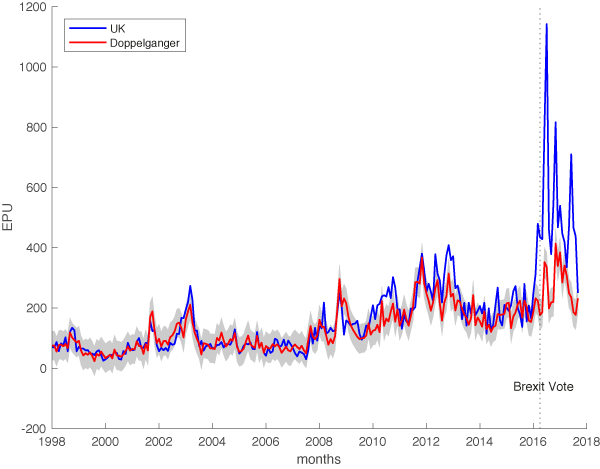 In a first step, we establish the increase in economic policy uncertainty due to the Brexit vote using this method, this time relative to the Economic Policy Uncertainty (EPU) index (Baker et al. 2016) (www.policyuncertainty.com). This index measures the volume of news articles discussing economic policy uncertainty (normalised to average 100). 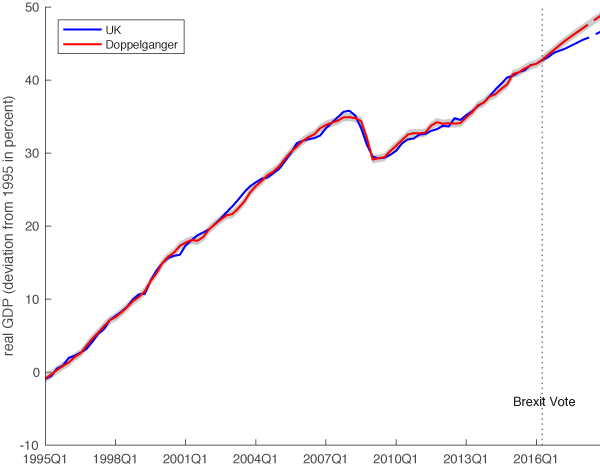 In Figure 3, the blue line represents the policy index for the UK; the red line is the EPU in the doppelganger economy. Note that, in this case, the doppelganger economy is not identical to the output doppelganger discussed above because different data are availability. The figure shows that the increase in uncertainty in the UK due to the Brexit vote has been large. It dwarfs, in particular, the increase in uncertainty during the Great Recession. As Baker et al. (2016b) point out, the increase in EPU has been concentrated in the UK, which we can also see in Figure 3. This is remarkable, because global policy uncertainty has been high due to, among other things, the US presidential elections. Yet we find that the increase of EPU in the UK exceeds the EPU doppelganger by about 250 points in the year following the Brexit vote. Following the arguments of Baker et al. (2016b), the uncertainty effect of the Brexit vote on output may thus be comparable to that of the Great Recession – that is, a decline of economic activity of about one percentage point. At this point, we cannot reject the hypothesis that the output loss so far is entirely due to increased policy uncertainty. But current forecasts suggest that the output loss is going to increase. Anticipation of the impact of the post-Brexit regime is likely to be felt already. We will be able to say more about this once we update our assessment in the spring of 2018. This is a novel approach to tracking the realised output losses that can be causally attributed to the Brexit referendum. Currently, at the end of the third quarter of 2017, the output loss has been close to £20 billion or 1.3% of GDP, reflecting heightened uncertainty evident in less investment and a reduction in consumption. Current estimates suggest that the economic costs of the Brexit vote will rise further – even before the UK actually leaves the EU. We will update our estimates on a regular basis as new data come in. This will make it possible for economists and the wider public to track the evolving costs of the Brexit process in an unbiased, transparent, and entirely data-driven way. Abadie, A, A Diamond, and J Hainmueller (2010), “Synthetic control methods for comparative case studies: estimating the effect of California’s tobacco control program”, Journal of the American Statistical Association 105(490): 493–505. Abadie, A, A Diamond, and J Hainmueller (2015), “Comparative politics and the synthetic control method”, American Journal of Political Science 59(2): 495–510. Baker, S, N Bloom, and S Davis (2016b), "Policy uncertainty: trying to estimate the uncertainty impact of Brexit", unpublished presentation. Baldwin, R E (ed) (2016), Brexit Beckons: Thinking ahead by leading economists, VoxEU eBook. Born, B, G J Mueller, M Schularick and P Sedlacek (2017), ”The Economic Consequences of the Brexit Vote”, CEPR Discussion Paper No. 12454. HM Treasury (2016), HM Treasury analysis: the long-term economic impact of EU membership and the alternatives, Research report.